New Delhi: The son of a gun is named Dhanush. Defence minister A.K. Antony and his cohorts in the armed forces are looking at it longingly. It burst last July in the Rajasthan desert while firing. Dhanush is a derivative of —you guessed it — the Bofors. It is here at Defexpo 2014, the show billed as a window to the world’s largest arms bazaar. Right here in the heart of Pragati Maidan, the Dhanush in olive green, its overlong barrel pointing skywards, is firing a slogan that Antony repeats like a mantra: be Indian, buy Indian. This, then, is the story of how a gun was “indigenised”. Later this month, the gun — the one here at this exhibition — is to be transported to Sikkim. The winter trials will be held there. It will be checked for accuracy, range and rate of fire; for its traverse and elevation capabilities; for its shoot-and-scoot ability. Sounds familiar? Yes, these were the words used to describe and justify the purchase of 410 Bofors FH77B02 guns in 1987. Now, as it was then, the Indian army is bereft of big guns. Its “field artillery rationalisation programme” has gone haywire. For nearly three decades the army has not inducted a single big gun. 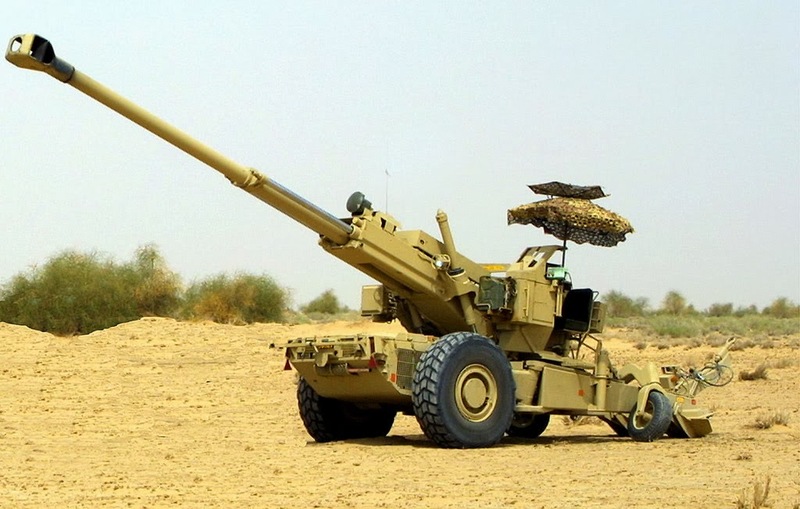 The Bofors bought in 1987 are being cannibalised to keep the artillery going. The army says it cannot wage war without these cannons or howitzers. The army has projected a need for five types of howitzers: towed, self-propelled, tracked, mounted and light. In all, it needs some 18,000 pieces of artillery guns to be comfortable with its war-waging potential. Realising the urgency, Antony went to the Gun Carriage Factory (GCF) in Jabalpore, where the Indian gun is being made, in September. Antony cut the ribbon. The “155mm” bay in Jabalpore ordnance factory is the assembly line for the Dhanush. So, was the gun already made? “No,” says the official. But he explains that, at the bay, they showed the components of the gun: the trailer, the carriage, the assembly, the barrel and the breech, the muzzle brake, the cradle and the saddle, the trunnions. The original Bofors — the Dhanush ka baap, if you will — is a 155mm/39cal gun. The Dhanush is a 155mm/45cal. The increased calibre means a longer barrel length for a longer range. The original Bofors had a maximum effective range of 27km in the plains. The Dhanush’s shell is claimed to top 35km. The Dhanush is an improved version of the Bofors, says Tushar Tripathi, director of weapons systems at the Calcutta-headquartered Ordnance Factory Board. The Jabalpore factory has so far manufactured six Dhanush guns. The fourth one burst during an internal trial in the Rajasthan desert last year. Ahtesham Akhtar from GCF Jabalpore says the gun had already fired 250 rounds; so the barrel overheated. The sixth gun — on show here — is a further development. It is ironic that India began organised manufacturing of guns more than 100 years ago. The Ichapore Rifle Factory near Calcutta was producing firearms even before WWI. Yet, India’s armed forces are short of guns and its defence industrial complex is struggling to make them. It is an axiom of truth that whatever is aplenty at the Defexpo is in serious short supply. The latest edition of the expo of the largest arms bazaar is seeing the showcasing of several big guns: by the Tatas, who have driven a Denel-derived, truck-mounted gun all the way from Bangalore; by Larsen and Toubro, which is exhibiting a version of the French-origin Caesar/Nexter; and, of course, by BAE Systems — to which Bofors AB now belongs — which has hauled its ultra-light M777 over here yet again. Pragati Maidan is a bayou in which to have fun with a gun.